The new REVO Connect app is finally here! 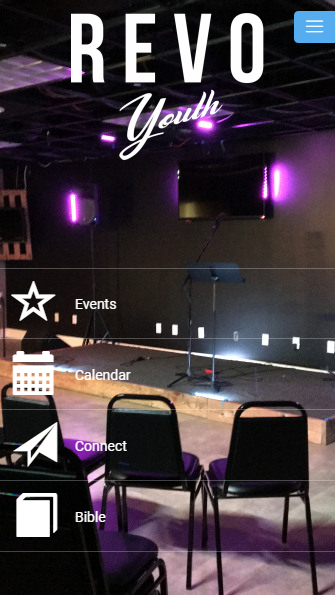 Use this app to check outupcoming events, read your bible using the Bible plugin, and toconnect using the Connect feature! Download it today! We are proud and happy to release the first version of Tamil Biblein android for free. This app contains both "Old Testament" and"New Testament" in Tamil. This is our first effort in bringing youbible in Tamil. We sincerely hope that this app will rejoice you.App requires two permissions, namely 1. Your Location (ForAds)& 2. Network Communication (For Ads) With your support, wewill add more features in future releases. Tamil Bible AdFreeversion is available in the market. Support us by rating the app.For users of Tamil Bible (Roman Catholic) Thiruviviliam, kindlysearch for Tamil Bible RC in android market or download the app inthe following URLhttps://play.google.com/store/apps/details?id=com.softcraft.tamilbiblercMail Us your feedback **** Changes done in previous versions ******Version 3.9 * Implemented 1000 praises for easy to read. *Implemented History of Daily verses. * Implemented verse andchapter to add Bookmark (page). * Add backup and restore insettings page. * Add notification for reading plan . * Integratedlatest Facebook SDK. * Add bookmark chapter in bible details page. * Add new UI for select book,chapter and verses in bible detailspage. * Solved crash report. **** Changes done in previous versions****** Version 3.4 - 3.6 * Bug fixing ***** Changes in CurrentVersion (3.3) Released on 12 Jun 2016 ***** * Bug Fixing * Spellingerrors corrected as received from users. * Multiple verse sharing,bookmark etc.. * Daily verse fine tuned to show only encouragingverses * News page. * Daily verse page * Near by churches********************* 3.1 * Bug Fixing * Support to AndroidLollipop * Day / Night Reading modes added to settings * Screenbrightness adjustment * Option to change settings in the readingpage added, so that users can visually view the changes made insettings * Spelling errors corrected as received from users. 2.3Whatsapp Sharing include Copy content added Verse error Correctionsas suggested by users. 2.1 * Option to select ofChapter("Athigaaram") number by tapping on the BookTitle("Aagamam"). * Verse error Corrections as suggested by users. * The songs detail list is made expandable in the same page. 2.0Verse error Corrections suggested by users. 1.9 1.SMS sharing issuefixed. 2.Verse error Corrections suggested by users. 1.8 Changes:1. Layout / UI Change 2. Added Christian Songs 3. Enhanced Search /Sort facilities 4. Share through SMS/Facebook/Email Option 5. Verseerror Corrections suggested by users. Bible.is offers mobile access to Scripture in more languages thanany other Bible app, and includes access to hundreds of dramatizedAudio Bibles as well as the JESUS film. READ the Bible, LISTEN tothe Bible, and SEE the Bible as never before anytime, anywhere inthe world! Bible.is features: - Access the Bible in over 1,800+languages—all at NO COST to you. - Listen to beautifully dramatizedScriptures in hundreds of recorded languages. - Search Biblepassages by language or by country. - Choose your display language:Arabic, Chinese, English, French, Spanish, Portuguese, Russian,Vietnamese, Farsi (Persian), Dutch, Hebrew, Indonesian, Italian,Korean, Thai, and many more. - Download text and audio for offlinereading and listening anytime, anywhere. - Look up keywords, booknames, or specific verses. - Bookmark, highlight, and add notes.You’re one tap away from clear, intuitive Bible study tools. - SeeGod’s Word come to life in the JESUS film, available in hundreds oflanguages. - Share any Bible verse via Facebook, Twitter, SMS, andemail in just one tap. - Stay in sync. With a free Bible.isaccount, you can access personal bookmarks, highlights, and noteson the Bible.is app or online. Bible.is, a ministry of Faith ComesBy Hearing, a 501(c)(3) non-profit ministry dedicated to gettingGod's Word to everyone, everywhere. All U.S. donations are taxdeductible. —JOIN THE BIBLE.IS COMMUNITY— Email ideas and concernsfrom within your Bible.is app: [email protected] Join our growinginternational community on Facebook: www.Facebook.com/Bibleis.Follow us for daily Scripture on Twitter: www.twitter.com/Bibleis.Access more resources at Bible.is online: http://bible.is. Enjoy listening mp3 audio bibles freely. Application includes 28versions in different languages: English Standard Version (ESV),King James Version (KJV), New King James Version (NKJV), NewInternational Version (NIV), etc. Main features: + Backgroundplayer: You don't need to open the app every time to listen yourfavourite bibles. + Schedule verses to listen in specific time. +Download for offline listening. We hope you enjoy the app and giveus best rating and feedback.